Come apply for a Passport at the Pittsfield Post Office, 2 Elm St., Pittsfield, NH! Our Passport Acceptance Hours are 8AM-11AM/1PM-3PM. Monday to Friday, No appointment required. Saturday, 8-12, appt. required. You must present: evidence of US Citizenship, photocopy of Citizenship evidence, photo ID, and photocopy of photo ID. We have a Saturday Passport Event scheduled for YOU! Saturday, April 21st, 8AM-2PM. We can take your photo, too! The library trustees requested a public hearing to receive input on the fate of the barn behind 33 Main St. It will take place as part of the BOS meeting May 22. If you have an interest, please attend. Minnie Plante was reappointed to Parks & Recreation. The police dept. reported on hiring progress- it looks promising due to a better than expected number of applicants. In the meantime, we still depend on hiring outside details to make up uncovered shifts. Barnstead has been extremely cooperative in this regard and the BOS thanks their Chief and the town for helping us out. Good news and bad news on the road paving- we have the go ahead to bid out Safe Routes to School and our scheduled projects. The bad news is all the paving companies are buried in work so prices will probably be higher and we will be put at the end of the list. The state is also supposed to get going on their roads through town. We expect to see at least a portion of the work done by Old Home Day. BCEP rep. reported that the hill where brush had been accepted has been closed by the state due to plastic bags that ended up in the cat litter bin, and consquently the compost pile is in violation. Brush can be taken to Pembroke where it is accepted for free. Info at BCEP. The CDC reported they are participating in a "First Impressions" initiative with Tilton. Our CDC will make observations about their downtown and they will do the same in Pittsfield. Should be interesting. Numerous book-keeping items rounded out the night. 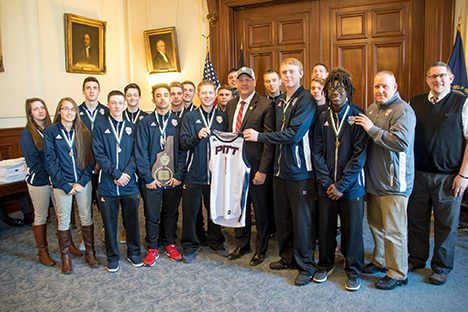 Governor Sununu welcomed the Pittsfield Middle High School Varsity Boys Basketball Team to the State House Wednesday, April 11. During the Executive Council Session, Governor Sununu presented the team with a Commendation for their positive representation of Pittsfield's community and winning the school's first ever Boys Basketball State Championship. The boys presented the Governor with an autographed team photo and a Pittsfield Basketball Golf Hat. 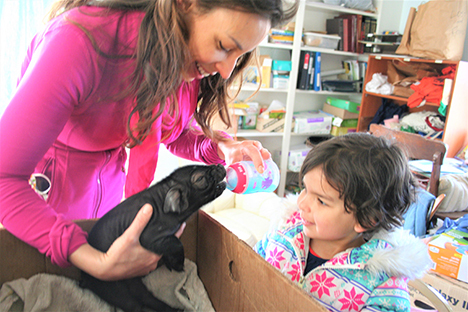 Feeding: Dr. Elizabeth Taglauer and her daughter Alanna, visitors to the farm, help nurse a formerly "squished piglet" to health. 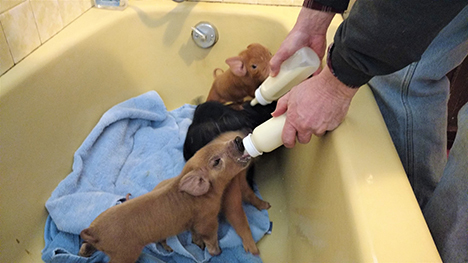 Piglets have a temporary home in the farmhouse bathtub. There are seven baby pigs in my bathtub. I thought one or two would need help, but three days after their birth it seemed wise to move the surviving seven to the farmhouse. Even though she was an attentive mother with her previous litter, Lucky was not so conscientious on this occasion. Fourteen had been born, only seven were still alive. I had to take action. Lucky is a very calm sow. She never objects when her I handle her babies, and they squeal. Typically, mothers become aggressive when their young cry out…but not Lucky. After giving birth, Lucky seemed lethargic. I discovered that she was running a high temperature of 104.1 and needed medicine. As she had also developed mastitis, it was time to administer penicillin. She barely complained when I jabbed the needle into her neck. After receiving two treatments, her temperature came down to 102.5, but she continued to be lethargic. She hadn’t moved all day while her young nursed. Despite my pushing, shoving and coaxing, Lucky would not stand until I offered her a bucket of water. Giving water to a prone pig is like trying to drink while lying in bed; not very efficient. As the water poured onto the floor, thirsty Lucky perked up and struggled to her feet. Her thirst proved motivation to get her up from her bed. After guzzling two gallons of water, she carefully settled back down with her babies. All seemed well until the following morning. Both piglets were still breathing when I found them although one was extremely cold. They were apparently squishing victims of a 700-pound careless mother. Despite my efforts to help them, both died. Later that morning, I found two more wedged between Lucky’s front legs and a board. One survived. Only seven of the original fourteen newborns remained so to save these seven I decided to relocate them to my warm bathtub where there would be no more ‘death-by-mother-squishing’. Lucky will be given her remaining course of penicillin and then move in with other adult pigs. The ‘lucky seven’ survivors will spend at least a week in the bathtub, and then move onto the porch with House-Pig ‘Tazzy’ until they are able to eat solid food. When it’s warmer, they’ll move to outside housing. A bull calf arrived the same day as the piglets. Misty, a Scottish Highlander cow, gave birth to a healthy red boy named Alan ….. all without any cow-drama. We brought mother and son into the holding pen to keep an eye on them. Alan is the first of seventeen calves expected this Summer. May all the bovine births go as smoothly. The pig-drama continues. Bruce and I now have to bottle-feed seven ravenous babies three times a day. Does anyone want to lend a hand? It’s hard working with pigs because whatever you do they are likely … to squeal on you!